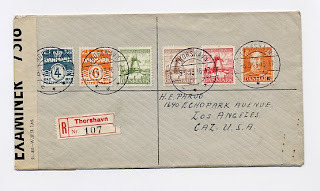 Registered cover sent from Torshavn, Faroe Islands (Denmark) to Los Angeles, USA. 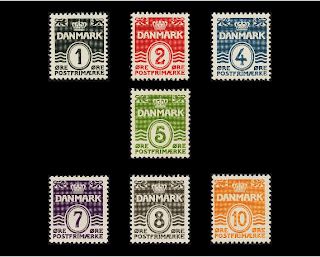 Post marks over the stamps of 4øre and 6øre from the Wavy Lines stamps issues of 1933 and 1940, the stamps of the 1937’s Dybbö’s Mill stamp issue and the 30 øre stamp from the 1943 Christian X stamp issue. 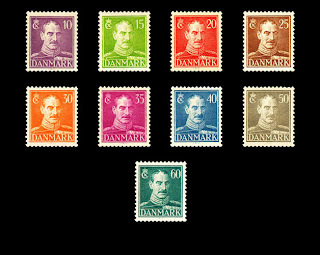 Cover sent from Torshavn on the 8 of June of 1943. Special label at the left side indicates that the cover was been opened for inspection.